Luther’s ancestors, an old well-established farming family, came from Möhra. 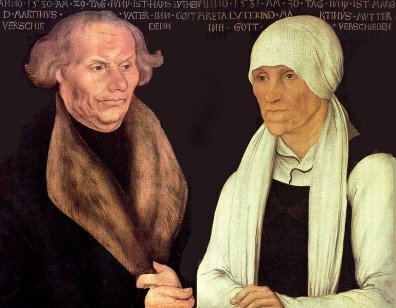 Luther’s parents, Hans and Margarethe left their home in 1483, shortly before Martin’s birth, in order to find their fortune in the County of Mansfeld. Many people moved to be near the growing copper mining opportunities at that time. 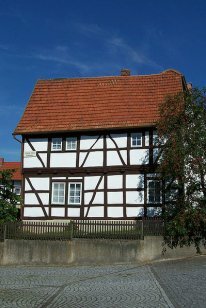 The Luther family home can be found in the center of Möhra on what’s called today “Lutherplatz” (Luther Square). Here is where Hans Luder, Martin Luther’s father, was supposedly born in 1459. The Luder family possessed 5 farmsteads in Möhra and was pretty spread out among the neighboring villages. On his return trip from the Diet of Worms, Luther made a stop from May 3rd and 4th, 1521 in Möhra. 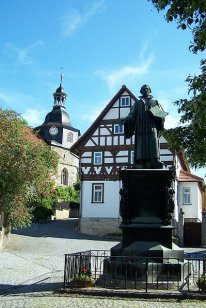 On the village square – today the Luther Square – he supposedly preached a moving sermon. The Luther monument dedicated to that event in 1861 was inspired by Ludwig Bechstein, who was a teller of fairy tales and sagas. In Luther’s day, there was only a little village chapel on the location where today’s Luther Church stands. There is a small exhibit in the church on “Martin Luther and Möhra”. 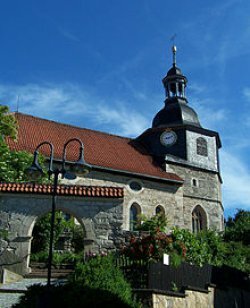 The church is open daily from 8:00 till sunset. The ancestors of Martin Luther come from the village of Möhra, which is situated approximately 20 km south of Eisenach. The Luthers (or Luders) belong to the oldest families in Möhra and go back to the 14th century. Today, in and around Möhra, there are many families with the name Luther. They mostly trace their lineage to Martin Luther’s uncle, “Little” Hans, who inherited the family land and remained in Möhra. Möhra is also connected to Martin Luther’s so-called “kidnapping” on his return trip from the Diet of Worms. On May 3, 1521, he stopped over and on the evening of May 4th, in nearby Glasbachgrund under the direction of the Elector of Saxony, Frederick the Wise, he was captured and brought to the Wartburg Castle.